We supply two types of JUGS American Football ball machines: The "Football Passing Machine", and the "Field General"
The JUGS American Football Machine throws perfect passes, punts and kickoffs to any precise spot on your field. Your player can practice catching perfect spirals or end-over-end "kicks" at any speed or distance you choose from 5 yards to 80 yards. Running backs, tight ends, and wides receivers need constant practice catching the football. With JUGS, these players catch more passes in a weeks than they normally would in an entire season. Defensive backs and linebackers can be given practice on a variety of reaction and zone-coverage drills in a short period of time, without having to take your best quarterback away from where you really need him to be - with the offensive unit. 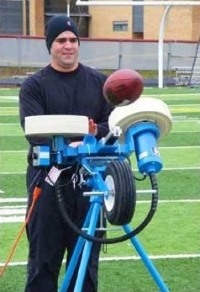 A substitute player, or even team manager, can operate the JUGS machine, thus freeing your coaching staff, quarterbacks and punters. 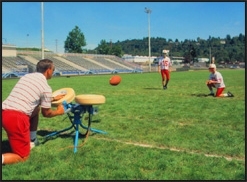 On punt and kickoff-return team drills, you do not waste any time with a machine doing the "kicking". \high-lofting end-over-end "kicks" go exactley where you want them to - so your players learn their assignments quickly. 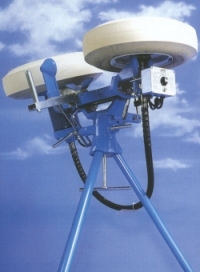 The JUGS Football Passing machine is powered from a 220v mains supply or can be powered from an inverter type petrol generator. 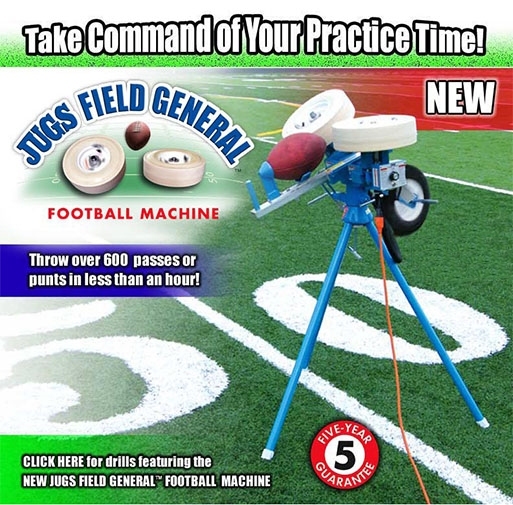 The JUGS Field General is a smaller and lighter machine than the JUGS Football Passing Machine and throw spiral "kicks" but not end-over-end "kicks" . It will throw accurately up to 50 yards, allowing you to hit your receivers in stride, running any route in your playbook. Ut simulates punts with a hang time of over 5 seconds, allowing you to do drills that include both punt and punt return teams. It's light-weight and portable - weighing less than 44kg. It also comes with its own transport wheel. This makes the new JUGS Field General easy to move to any spot on the practice field. 1. Receivers and Running Backs need consistent practice catching the football. With the Field General, these players see a week's worthof passes in a fifteen-minute drill session. Simply put, more passes caught means more receptions in games. 2. Defensive players can be given practice on a variety of reaction and zone-coverage drills in a session without taking your quarterbacks away from their work on offense. 3. 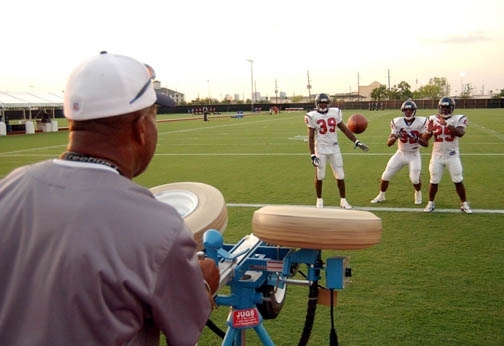 With hang times of up to 5 seconds, the Field General can accurately "kick" high lofting punts directly at one player or another, or at any point in between. 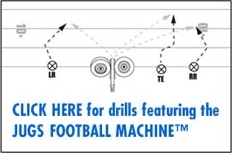 You can save 30 minutes of practice time each day because, with the Field General, you will eliminate shanked punts. Remember, crisper special team drills will produce the game results you want. 4. Use the Field General for more effective and enjoyable conditioning drills. All players like catching passes - they'll love sprinting after 50-yard bombs thrown from the Field General.